Samit holds an M.Sc. (Hons.) in Physics and a B.E. (Hons.) in Electrical and Electronics Engineering, both from the prestigious Birla Institute of Technology & Science, Pilani (1994). He also holds a Master of Science degree in Electrical Engineering from the University of Hawai’i, USA (1997). Samit started his career with Tata Elxsi in India and subsequently worked both at Hawai’i and Los Angeles in the area of network communications before returning to India in 2000. He has been actively involved in various capacities and stages in all functions at PLUSS since 2003. Currently as Managing Director, Samit heads the overall strategy, marketing and finance portfolios. 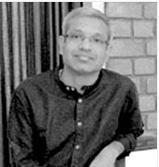 He has led conceptualization and development of various new projects at PLUSS and spearheaded the equity investment of Tata Capital Innovation Fund into PLUSS for development of the current products at PLUSS. He has spoken at several national and international conferences over the years on promoting energy storage and phase change materials. Extremely passionate about environment, he engages in environment conservation projects with school children as part of Advit Foundation, a not-for-profit organization based in Gurugram. As a trustee of Advit, he has worked extensively to propagate Energy Efficiency and Renewable Energy through various seminars held by GIZ, Germany, Bureau of Energy Efficiency and State Nodal Agencies for Renewable Energy. Samit would ideally like to create a company based on ethics and values with a culture that will transcend the organization. A company will be known by its people, so people come first for him. Keenly interested in classical music, he hopes to soon find time to start playing the Sitar again. An avid marathoner, with a conviction that good health is the key to success, Samit has successfully completed the Los Angeles Marathon, the Airtel Delhi Half marathon several times and the Standard Chartered Mumbai marathon. He aims to participate in all the major marathons around the world one day!